John Riley was born (as best as I can make out) on-board the convict ship, the Kitty as it found its way to the fledgling Australian colony in 1792. Some accounts have him being born on arrival and some have him being born aboard the ship. What is for sure is that he was the free-born son of his mother Susannah Nairn/Nairne a convict who was bound for Australia. Despite the fact that he was given the name Riley (which was his mother’s husbands name back in England). The time she had spent incarcerated and the time spent on the voyage out to the colonies meant he could not have been John’s biological father. Hence John becomes a brickwall in our journey backwards for his paternal line. John’s mother would later re-marry this time to a fellow convict, Robert Wells in Parramatta, in New South Wales. John had at least one half sibling from his Wells step-father and mother. His sister was Esther Wells. John also had (I expect) another half-brother left behind in England in Thomas Riley. Catherine Lattimore was a native of England. After much hunting I’ve been able to find a record which I hope answers the ‘how old was she’ question. According to the 1828 Australian census, Catherine gave her age as thirty and that she was born in either 1797 or 1798. All the other records on the census match from what is known about her. Catherine is also recorded with the spelling of Lattimore along with Latimore, Latimer and Lattimoore and at one stage even Lettermore so it gets a bit confusing. Her parents could be John and Elizabeth Lattimore, baptized 21 Feburary, 1797, Birmingham, St Phillips parish, Warwickshire. Catherine was convicted at the Warwick Lent Assizes I’m estimating at the age of 15 or 16. This occurred on the 29th March 1813 for the charge of larceny. She was accused of stealing from a shop. Catherine was sentenced to death which was commuted to transportation aboard the Wanstead to the colony of Australia for 7 years. (However on other muster records it says ‘life’). This was not the first time Catherine had fronted the Warwick Assizes. She had previously been tried at the Warwickshire Lent Assizes in 1808 for larceny. On that occasion she had been acquitted, perhaps her young years was the reason she was acquitted at that time or not enough evidence? At that time she was recorded as Cathe Latimoore. Following her arrival in Australia aboard the Wanstead, (9 January, 1814) at Port Jackson, Sydney Cove, Catherine was assigned to the Parramatta Convict Women’s Factory as a Mantua Maker (cloaks for ladies). A mere year later she gained permission to marry John Riley (also found as Ryley) at Parramatta. They married on the 13th June 1814 at St John’s church in Parramatta, by banns. Their marriage was officiated by the colloquially known “flogging parson” Reverend Samuel Marsden. So named for his reputed predilection towards apportioning flogging as a punishment for criminal activity. At the time Catherine would have been around sixteen years old. On the 1825 convict muster Catherine is recorded as the wife of John Riley. By March 1822 the Riley’s had moved up the social scale in the colony when John was appointed to the position of District Constable in Prospect, NSW. Whilst there were some advantage to this ‘government’ role, constable’s were not as a rule well liked by convicts, ex-convicts or settlers in the colony. On the 11th August 1826, John was accused in the ‘Up Country Police’ reportings in The Monitor, of robbing and allegations of extortion of settlers in the district and abusing his role as a district constable. John and Catherine both appeared in court alongside a John More. The two John’s had been accused of theft against one James Carr. 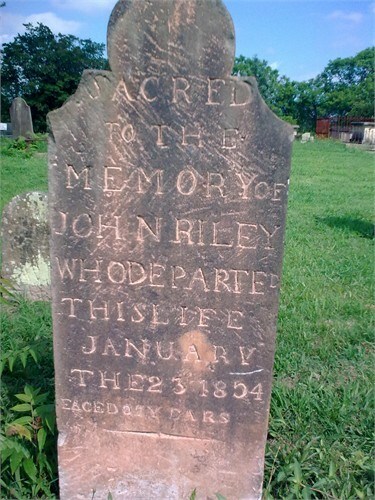 John Riley was recorded as an accessory. However, it appears this was no simple accusation. James Carr, Maria Carr and a Jane Beams were accused by Catherine of assault and rescue. (Not sure what this meant). There was so much information given in the case both pro and con for each side that the case was referred to the Attorney General. John and Catherine were recorded in the 1828 census as still living in Prospect. By this time, John and Catherine had three children. John aged 6, Diana aged 4 (my 3rd ggm who would go onto marry William London) and Susannah aged 2. They gave their religion as Protestant. During this time John was working as a Police Constable and pound-keeper in Parramatta. However the case with the Carr’s turned out? John must have been quit of wrong-doing as he was still a constable in 1837 and appears in print at different quarter-sessions (court hearings) in a witness/prosecuting role for different cases. One of John’s roles whilst he was employed as a constable included bringing up prisoners (convicts still serving their terms) from Parramatta to Windsor in carts and conveying them to their places of allocation and work. John eventually left the police force and relocated his family to the Upper Colo where he bought 60 acres of land on the Comleroy Road near Slopes Road in the Kurrajong. The Kurrajong being not far from the township of Richmond in the Hawkesbury district of New South Wales. The property had been apparently known as “The Garden of Commons” for which I have not so far been able to find any references. During their married lives they added to their family Elisabeth Riley, Edward Riley and Martha Riley. John died on the 23rd January 1854. According to his grave headstone he was aged 61 and is buried at St. Peter’s Cemetery in Richmond. After his father’s death in 1854, John and Catherine’s son, John (Jnr) Riley who was listed as his next of kin applied for letters of administration to the estate. John Riley Jnr, sold thirty acres of the existing farm to his brother-in-law Albert London for fifteen pounds. This land was on the lower half of the property and suited Albert in his farming endeavours. Immediately following his fathers demise John Riley Jnr had published a warning in the papers warning against purchasing any sheep, horses, property or personal items etc. from his parent’s property. I suspect he was ‘insuring’ against anything going missing from the farm prior to him completing his sales and closure of his father’s affairs. Riley and Edward Riley, or either of them, or any person whomsoever, without my written consent and authority, any of the cattle belonging to this estate, branded OR on the hip, running at Big River or at Yango, as I claim the same as my property. Dated this 22nd day of May, A.D. 1854. her CATHERINE X RILEY, mark. So was there a breach in the family over the property? The remaining property which fronted the Comleroy Road stayed with John Riley Jnr. This land would later be used for a brick-works by another family member, Albert London’s grandson, Henry Bottle. The brick-works with bricks stamped HB were reputed to be frequently used in the area for building works. How marvellous it would be for the Bottle family to still have some of those bricks for posterity! I thoroughly recommend a read of the article A Link to Some Early Settlers of Comleroy Road and to Brickmaking in The Slopes Area by Valerie Holland. Catherine died in North Richmond on the 18th June 1868 and is also buried in the same graveyard as her husband but as I understand it not the same grave. There is a most remarkable publication (available free online) at Women Transported, Life in Australia’s Female Convict Factories put together by the Parramatta Heritage Centre and University of Western Sydney, Catherine (Lattimore) is listed as one of the women in these factories. A fabulous read. In a bizarre twist, Catherine’s mother-in-law, Susannah Nairn would marry a man called Robert Wells. After Susannah’s death he quickly re-married another convict, Sarah Longhurst who had arrived on the same ship (the Wanstead) with Catherine. I noticed that Catherine Lattimore was sentenced on the same date at Warwick Assizes as Mary Morris. They were both transported on the Wanstead and rowed up the river to Parramatta. You maybe interested in my book The Campbelltown Convicts. It seems that Lattimore, Jennings, Morris O’Flerty and Smith were sentenced to death. Lord Sidmouth the Home Secretary wrote to the justices of the peace of the Midland Circuit on 30/4/1813 and respited them on the condition that they be transported to the coast of NSW for 14 years. I’m not sure if the others were also sentenced to death. Gah, thanks Peter I am sorry I have not responded sooner. I missed this post. Thank you so much or pointing me in this direction. I’ve included your book as a recommended read. Cheers. Darienne. The age recorded on Catherine Riley’s death certificate was 78 giving an approximate year of birth as 1790. Her age is given as 22 on her marriage record in 1814, suggesting she was born about 1792. 1797 is much too late to be her year of birth. 1791 or thereabouts seems most likely. I’ve wrangled backwards and forwards with this one too. The only ‘best information’ I’ve been able to secure is on the 1828 census. Even I thought she was pretty young to be married at say 16/17. I’ve not seen her death certificate so I would be interested in finding out more about this particular question? I will be happy to be able to close out this mystery. Cheers. Darienne. Please find attached a copy of Catherine Riley’s death certificate from 1868. I ordered it way back in 1991 when the BDM were still giving photographic copies. The informant was her son Edward Riley. The ‘8’ in her age is an unusual configuration to our modern eyes but it is the same as in the year 1868. Note the ‘0’ is done differently in the childrens’ ages column. I still think she must have been born around 1790-1792. Her age on the convict indent is given as 22 for 1813/14. I think her 1828 Census age was a bit liberal, perhaps. Another mystery that I’ve recently discovered is that her husband John Riley is listed on the 1822 Muster (apparently taken between 2-13 September) as having two children – neither named. Catherine and John’s eldest son John is most usually listed as being born in 1822 (I think taken from the 1828 Census) although apparently his tombstone has him dying at age 92 making him born about 1815. So, it is possible that one of the children listed in the 1822 muster with their father was John Riley Jnr, and perhaps they had another ‘undiscovered’ child who later died. In any case, I’ve always thought that it was a little unusual to be married in 1814 and then not to have children until 1822, and six at that. It makes sense to have had earlier children. I can’t find any burial records for them though. I’m not convinced that Catherine’s maiden name was Latimore either. I think it probably was Hines (or a variant of this) and she married a Latimore before she was transported. There is a record in the Warwick Assizes in 1808 for a Catherine ‘Latimoore’ who was tried and acquitted of larceny. If this is the same person, and she was in fact born about 1791, she would have been about 17 years at the time. Furthermore, there is a record for a Catherine Hines who was tried for larceny at the Warwickshire Assizes in January 1807 and who was luckily ‘discharged by proclamation’. Also, there is a marriage record for a Catharine Hines to Thomas Lattimore on 21 Dec 1807 at St Martin’s Birmingham, Warwickshire. Of course, I can’t say this is the same Catherine, but as you know previous marriages flew out the window when people came to Australia. Please feel free to share the death certificate or use it for your blog if you like. I recently posted it an Ancestry where I’ve also had my mother’s DNA sample tested. We descend from John and Catherine’s daughter Martha (b1834) by the way. I wish you and your family a happy Christmas and a great 2017. I see you stated Catherine traveled with 118 other souls to the colonies in New South Wales aboard the Sommerset in 1813, yet you also mentioned she was on the “Wanstead”, can you please confirm the ship?